Authentic, easy to make comfort food at it’s finest! 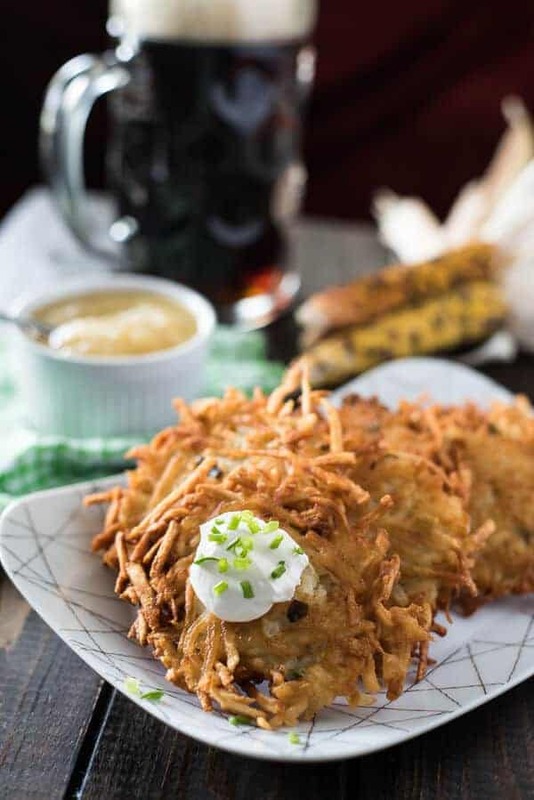 These classic German Potato Pancakes, served with a side of applesauce or sour cream, are just what you need to kick off your Oktoberfest, and make a great snack any time of the day! Visiting Germany is at the upper part of my bucket list. Well, all of Europe is, of course (this wanderlust won’t quit,) but especially my homeland. My father’s side of my family is German, and with my mother’s side being Polish, I naturally gravitate to all food Bavarian in nature. Bratwurst and Kielbasa, Sauerbraten and Sauerkraut, the flavors that many turn their noses up at I embrace with open arms. Bring on that Oktoberfest food! Ahhh, Oktoberfest. A 16-day German food and beer festival. OK, so there’s plenty more to do during this 200ish-year-old (albeit spotty – some years had no Oktoberfest due to war) national celebration. From games and rides to parades and music new and old, think of it as a big state fair with something for everyone to enjoy. And, since it’s synonymous with Germany and Oktoberfest, there’s also plenty of beer to go around. Here’s something to think about: Oktoberfest celebrated its 100th anniversary in 1910, where something like 120,000 liters of beer were served. That’s quite a bit, right? Hang on, your mind is about to be blown. Fast-forward 100 years or so, and that number has shot up to over 6.7 million liters. 6.7 MILLION LITERS. Do you have any idea how much that is?! A liter, in our silly American metric conversions, is not quite 34 ounces. That’s almost the equivalent of 3 bottles of your typical American beer. So, to break it down, 20 million bottles of beer on the wall…in 16 days. Between 6.4 million merrymakers. So, that covers the beer. 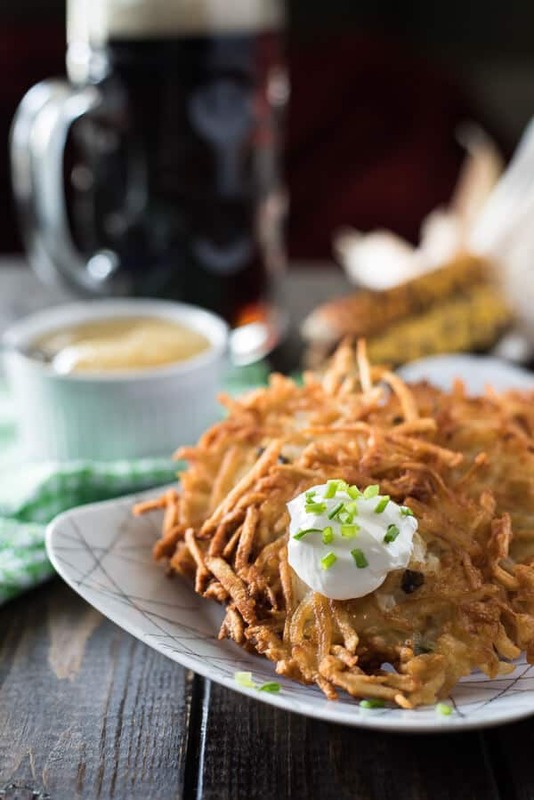 Kartofelpuffer, or potato pancakes, are a typical Oktoberfest food. But they’re actually more well-known for being found at Christmas street markets or during winter festivals. You know…Christmas really isn’t all that far away. And since these totally pass as Oktoberfest fare, we’re just gonna go for it, k? 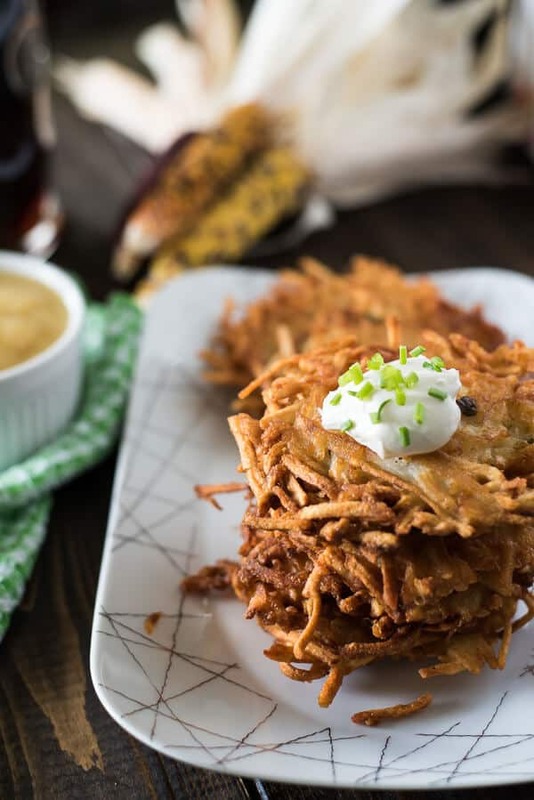 Besides, you could liken these babies to American hash browns, but in pancake form. They’re known by all different names around the world, but are prepared very similarly no matter where you are. Turns out us German folk aren’t the only ones who love comfort food. My Nana used to make these from time to time, and she always served them to with a big bowl of applesauce for dipping. 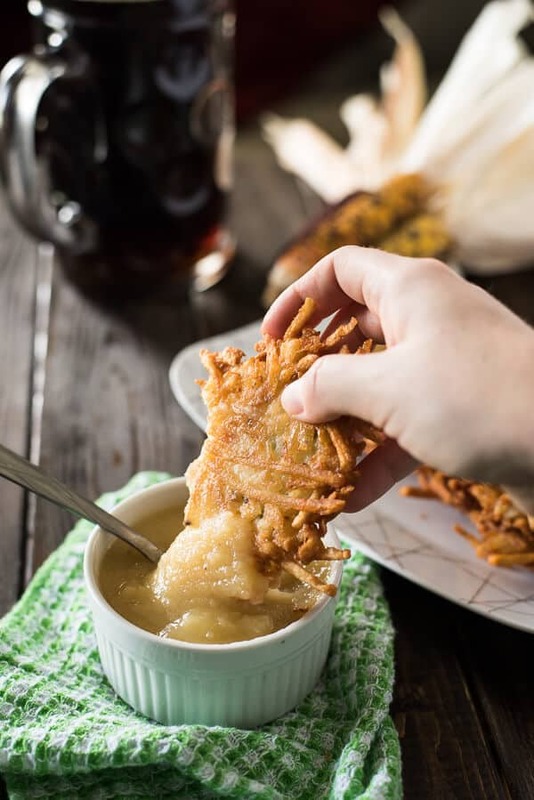 I think that might have been my favorite part at the time – I was an applesauce addict at one point, and until I did research for this recipe, I always thought she had that at the table just because I loved it so much. Turns out it’s one of the two most common sides. I’m hoping to get to Oktoberfest one of these years down the road. Although honestly, at this point I just really want to see that many bottles of beer. Clearly, no one parties quite like the Germans! For even more authentic German recipes, try these! Authentic, easy to make comfort food at it's finest! 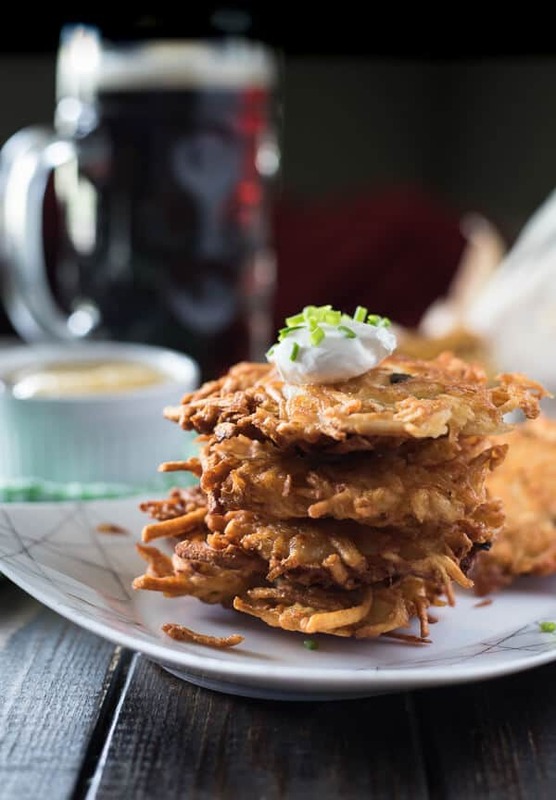 These classic German Potato Pancakes, served with a side of applesauce or sour cream, are just what you need to kick off your Oktoberfest, and make a great snack any time of the day! Use a box grater or food processor to shred potatoes and shallots easily. Place shredded potatoes & shallots in a strainer set over a bowl and let drain, squeezing mixture until dry. Transfer to another bowl, then slowly pour off the potato water, leaving the milky starch at the bottom of the bowl. Pour this back in with the drained potato mixture. Mix in green onion, flour, and eggs, and season with salt and pepper to taste. Work the ingredients with your hands until well combined. Heat 1⁄4 cup oil in a large skillet over medium heat. Working in batches, measure out ½ cup potato mixture and drop it into the oil, flattening it into pancake with the back of a metal spatula. Fry for 3-4 minutes per side, flipping once, until golden brown and cooked through. Transfer to a paper towel-lined plate or baking sheet. Repeat with remaining potatoes, adding more oil to skillet if needed. Serve with sour cream or applesauce on the side. Grab your fork and a beer stein and dig in to all these delicious Oktoberfest recipes below from my fellow #SundaySupper Tastemakers! These look great! 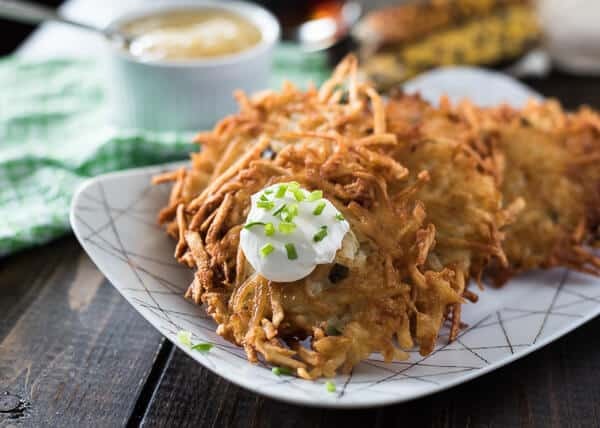 I love potato pancakes! I love potatoes ans these look awesome! Oh goodness, these look delicious!! 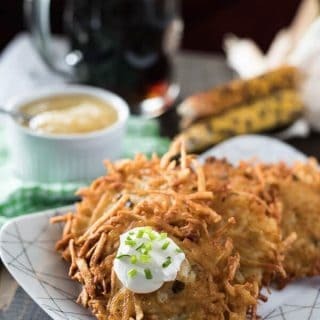 Makes me miss latkes! Great recipe! Love the simplicity combined with unique! Looks very appetizing! Potato pancakes are the bomb!!! Those look so crispy and delicious. I love how you dipped it in apple sauce too! Hope you get to make it to Germany someday. It is a beautiful country. Your Karttoffelpuffer look delicious!